When Lawrence Anthony was asked to adopt a herd of wild elephants he had no choice but to accept.These elephants were trouble.The Matriarch was an escape artist and had learned how to unlatch gates and snap electric wires. If he did not give them a home in his reserve these beautiful animals would be shot. 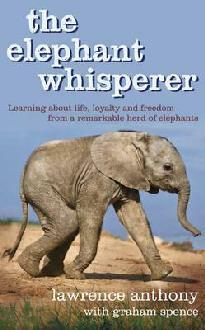 The Elephant Whisperer is an INSPIRING TRUE STORY about the relationship between a man and a rogue herd of elephants. How would you describe The Elephant Whisperer in three words? I haven’t read the book, Susan; though I believe the above comment would probably do it justice. Hi Carolyn, “It sounds great” works! It is not the type of book I normally read,but it is a fascinating story and I really enjoyed it!